Be real how many guys with short legs have you seen jump well, it has nothing to do with jumping but helps in bench press. Dr J, Jordan and a lot of NBA jumpers have long legs and shorter torso. The key part is to have a longer calf than a thigh that gives you more leverage. You look at the great leapers in the NBA and most of them have this build. Williams look to have this build too. Note small guys can possess longer legs than torso too. In a way it’s funny - on Wednesday I gave my Kinesiology class their joints exam; and no matter how much I warn them to read carefully and check their work, predictably two or three students will read “radioulnar” where it says “radiocarpal”, etc., etc. You did not respond to what I actually said. What I’m saying is actually very simple. The key part is, “all other things being equal.“ It is simple physics: longer tibias and femurs have more inertia to overcome. When you say “jump well” you seem to be talking about how high - but notice that I was referring, along with the P3 biomechanics guy, to acceleration at the knee. Seriously, please post and explain your expertise more. I want to learn more about your view of athleticism. I'd love to see some in depth analyses of the draft's athletic testing. I’ve watched him play. His defense and rebounding are for real. And his physical measurements aren’t Fab Melo like, they are Dwight / DJ like. That’s not the same. It’s hard to say what he will be because his college system is nothing like ours, but everyone has a right to be excited we got him at #27. He really needs to learn how to utilize his left hand when blocking shots. I began teaching Kinesiology and Anatomy/Physiology to undergraduates in 2003. I’ve done deep tissue bodywork since 1999, and I work mostly with clients who have pain. How unbalanced, asymmetrical movement leads to dysfunction is a daily preoccupation. Somewhere in there I taught dance for a couple of years. I love players who have fine motor skills and balanced, efficient, effortless movement. Jaylen Brown might be my favorite player, but Tatum and Ojeleye are not far behind. Don't worry, man, that's precisely the reason as to why we now have Jarrod Uthoff, lol . Meant to acknowledge the links you posted here - very cool. Gave you a Tommy Point. It's a very promising pick. And because of his amazing athleticism and wingspan, RW3 has the chance to be a big man steal much like Rudy Gobert, Clint Capela, Serge Ibaka, Deandre Jordan, etc. etc. Now will he turn into that, nobody knows for sure. It all depends on how much desire he has to become better and become one of the best in the game. The ceiling is very high, but it all depends on Robert if he's going to become one in a long line of Celtic big men greats. If he can reach the level of Robert Parish I would call this pick an amazing steal. One word of caution though, big men usually take longer to mature than other positions. So we might not see his true benefits until year 3. Or if we are lucky he takes a big step in year 2 and has everybody talking about him the way that Jaylen Brown made that year 2 leap into relevance. I think that you might have a point. In other words blocking the man he’s guarding without having to turn. Fab Melo could barely walk and chew gum at the same time. He was Fred Munster on the BB court. He had literally one one thousandth of the athleticism this kid has. 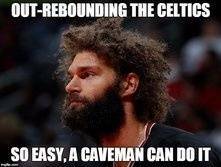 But he could play a 2-3 zone like no other! TP. 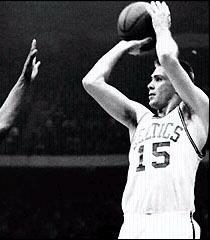 All the best shot-blockers in the league know how and when to use their left hand for contesting/blocking shots. All the scouts I rely on (including Mike Schmitz) rave when a big man prospect uses the left arm/hand to block or contest shots. 2. He loves to smash the ball like a volleyball whenever he can(good thing). The NBA would have less stiffs. Jay Larranaga said the Celtics are all disappointed Robert Williams missed his flight, will handle it internally. No details yet, but presumably that's another stupid move by the rook.